This may have been an all time favorite for me. I love every wedding but once in awhile, you get the perfect combination of amazing. Watching the beginning of a perfect love story and photographing a fun bridal party and then ending it all at the most fun and surprisingly elegant, Paul Brown Stadium in Cincinnati, Ohio. Stefanie and Sam met through mutual friends in downtown Cincinnati and it was love from the very beginning. Sam proposed at their favorite spot, The Netherland Plaza, and even hired a photographer to capture it all! Friends and family were back at Sam’s house waiting to congratulate the newly engaged couple. 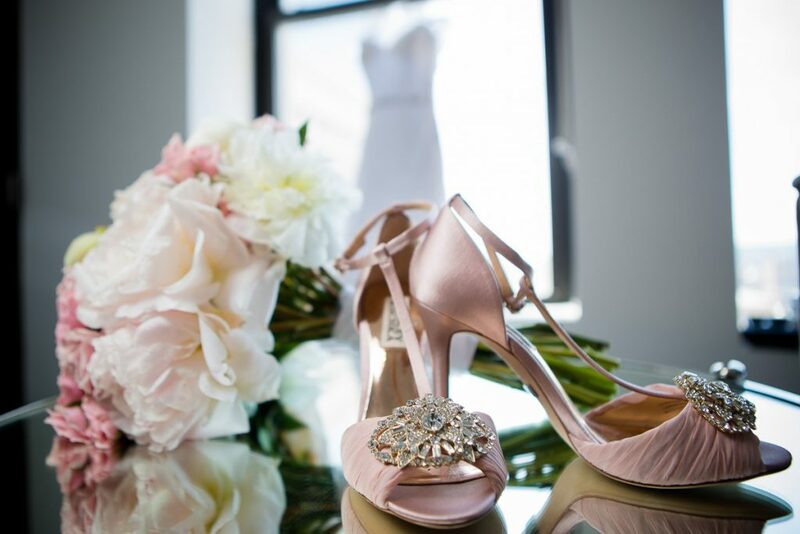 Stefanie chose blush and gold and wanted to go with a “classy and simple” theme to her wedding day. She has had a vision in her head for as long as she can remember of how her wedding day would be and it ended up exactly how she pictured! Stefanie insisted on being involved with every part of the decor. She spent hours the day before her wedding day to perfect every detail. She used blush rosette tablecloths on the dinner tables and blush tablecloths on the cocktail tables. Blush menus were folded in white napkins and placed on gold chargers. The flower arrangements were in gold mercury glass vases and placed on circular mirrors in the middle of the tables. Flowers were everywhere and played a huge part in the wedding decor. Pink and white peonies with pink roses in the bridal bouquets, church arrangements, centerpieces and on the cocktail tables. They were absolutely beautiful! Kotsovas helped Stefanie make the dress of her dreams. Her dress was lace with a scalloped cathedral train. The dress had a sweetheart neckline and thick lace straps and she added a beaded crystal belt. The veil was cathedral length and had lace details that matched the lace on her dress. The groom wore a dark navy suit with a black bow tie, black cummerbund, and black shoes. Stefanie and Sam chose the Renaissance Hotel in downtown Cincinnati, Ohio to get ready for their wedding day. I arrived to capture Stefanie getting ready and to get some beautiful detail shots. We went to P&G Gardens and Washington Park for the portraits before the wedding ceremony. The weather was absolutely perfect and we were able to capture beautiful photos! The ceremony took place at Saint Francis de Sales and it was beautiful. The two large arrangements of pink and white peonies were placed on pillars and just set the stage for a beautiful and elegant ceremony. You couldn’t help but tear up as you watched Stefanie and her dad walk down the aisle towards Sam. It was Stefanie’s favorite part of the day and it was mine too! Now it was time for the fun to begin! Rachel Geiger, the Private Events Manager, at Paul Brown Stadium, allowed us to go on to the field for some photos! before we entered the East Club Lounge, which is a stunning, 3-story atrium-style lounge that has a stunning view of the city. The reception took place in the East Club Lounge, which is a stunning, 3-story atrium-style lounge that has a stunning view of the city. It was fabulous! I was so thankful to be Stefanie and Sam’s photographer and loved meeting their family and friends. I’m so excited to see what the future holds for Stefanie and Sam! Click here to find out how you can hold your next event or wedding reception at Paul Brown Stadium. This entry was posted in Wedding Photography and tagged Cincinnati Wedding Photographers, Cincinnati Wedding Photography, Paul Brown Stadium.